We cannot stress enough..DO NOT STAY HERE!!!! It is quite possibly the most dangerous hotel we have ever endured a night in; people kicking doors down, smashing room locks and the most horrendous noise you have ever heard. So scared to the point that we didn't even turn our room light on in case it attracted the hooligans that were staying downstairs, we were truely petrified to think that no-one would know if something happened to us. There is absolutley no security. It is not close to Hotel Florida as advertised. You are given a map to find the hotel yourself. Balcony doors don't lock either. Curtains are not on the window rails properly. There are huge dents in all room doors where people have made attempts to break the doors down. Security guard......or the lack of! On a dark small road that is dangerous at night. Generally the most revolting place we have ever encountered. The fact that we lasted all of one night out of a week-long holiday says it all. The hotel is a tottal dissapointment! I knew it wouldnt be great when we were on the way there! but when we got there is was tiny the room really shabby , the balcony doors were tottaly cheap and rattles all night! the shower leaked and toilet didnt flush! everytime you went to the toilet u lost weight in sweat there was no window! I would never ever go here again! people were kicking the doors down early morning and in rage! where to start?? 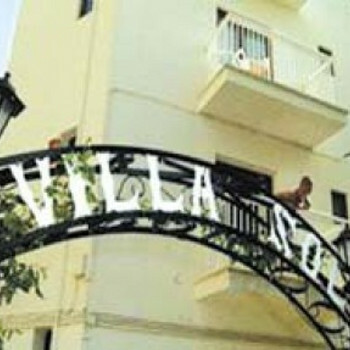 the villlasol was up heartattack hill an then some, you check in at hotel Florida and then they dont even tell you where to go and it is not next door!! it is down the road and up another little hill!! it has no security and is very noisy all night with people arguing and banging on doors!! the walls are as thin as air and it sounds like your door is goin to be knocked down!! Our view was nice on the 1st day just some grass then everyone started using it as a rubbish tip and started chuckeing chairs and empty cans and bottles and food wrapping over oh and people were weeing of there balcony when they got in! ew!! The maid!! well she would come in and stare at you for about 5 minutes untill you woke up haha and then change your towels only!! she did not do any cleaning!!! The room!! well it has only 1 plug socket which is behind the wardrobe and as far away from the mirror as you can get and when you do your hair you boil!! even though you have a fan it has 4 bulbs around it making it blow warm air! !your bedding does not get changed so avoid putting your sandy feet on the bed!! The shower overflows aswel as it is only about 2 inches deep with a scanky curtain around it and the toilet constantly smells of drains!!!!! one plus though is that it does have a safe and its quite secure! Overall the hostal was not the best but it was only 5 mins to the strip but at the opposite end to BCM and the hill is a killer in heels!! i would not say that you get your money's worth as our courtasy room was nicer than our actual room!! Overall though we had a laugh because if you didnt laugh you would cry!! Would definetly go back to Magaluf as the nightlife was fantastic but never again am i goin to a 1 star hostal when your friends pay the same amount and get a 4 star hotel!! I'm not quite sure what everyone is complaining about; it's a low budget accommodation-what do you expect? Considering the price that we paid for the roomI was expecting a lot worse and was actually suprised by the rooms. We got given clean towels everyday and the room and bathroom cleaned-which they left if we were too hungover to want, however, I was disappointed in the fact that our bedsheets weren't changed whilst we were there and we did have a problem; a leak, well two actually. We reported the problem to the reception and they had someone sent around right away to look at it, when they determined that it wouldn't be a quick fix they moved us to another room almost instantly. When we arrived we got our taxi to the hotel Florida and one of the staff accompanied us to the Villasol(we asked the taxi driver to wait whilst we checked in)-he even dragged our suitcases up the stairs for us. The hill is a bit of a challenge, but hey its exercise it's easier getting up than down when you're in high heels girls. The only real biggie I had with that place was the noise. Because there is no reception in the building, people don't tend to keep it down (understatement! ), someone must have reported it though, as a security guard was seen prowling the grounds. Kind of pointless when everyone comes in between 5 and 8. All in all if you're looking for somewhere to get your head down (depending on the time :P), then it's cheap, situated to everything so that you're close, but don't hear the noise-very basic, but who wants to spend time in their rooms on holiday?? My top three reccomendations for Magalluf would be Pirates (above all else), loved the pub crawls (which included bars and clubs) and the BCM (foam party was well the best, plus you get freebies). Hope this helped, wherever you end up have a great holiday. Forgot to mention, all the maids but 1 were'nt very nice, the reception staff were helpful though, we asked them to order taxis a few times - if you do go here, don't be afraid to ask for help and hire a safe - as I heard that someone got robbed. the hotel itself was in a pretty good location (apart from the really steep hill!) only 5 mins walk from the main strip. the hotel you check into is not next door as stated it was down a hill and round a corner quite silly really, it took us ages to find it. do not even attempt the hill in heels you will break your neck. the room was basic but had bed and shower the 2 essentials, and the cleaners were in every day with fresh bedding and towels. no facilities to cook though and ony one chair on each tiny balcony! i wouldnt go back for the pure fact the hill is so steep! but 4 a cheap place to stay guess you cant expect everything to be perfect! It was ment to be self catering but it didnt have... a ketle, microwave, cooker, pots pans.... put it this way it had two glasss, that where from the bathroom! On arrival we had no towels, a broken cupboard a leaking shower and leaking toilet and two hot taps on both. We also found that our front door didn't actually lock properly so our first day was spent complaining and attempting to have this fixed. The reception for this hotel is at another building so was also inconvenient. During our stay our sheets were never changed and our towels were handed to us every other day even though they were supposed to be changed every day. The hotel staff were rude and the room was basic. We encountered many other problems including our bathroom door jamming and the balcony door did likewise. I would not reccomend this to anyone the hotel doesn't even have a pool and although we made some great friends and had a good time our hotel was the one thing letting down the holiday. There is no entertainment and no board basis and although the site is close to the Magaluf main strip you have to walk up a very steep hill to get to and from it so this wasn't convenient either.